The 4000 Watt Solar Generator uses a Pure Sine Wave inverter rated for a 4000 watt Continuous output and 12000 watt Peak output. 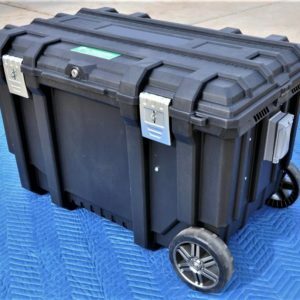 With a 4800 Wh (watt hour) 12 Volt Battery Storage & (4) 150 Watt Solar Panels, this is a capable, powerful system which is ideal for off-grid, mobile and emergency backup power. 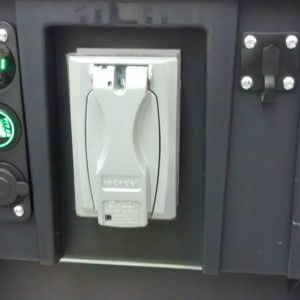 The most popular feature of this generator is the direct connect terminal block, which allows a 300 percent surge capacity for up to 20 seconds. When using the terminal block, this inverter peaks at 12000 watts with the power to run many tools and appliances with startup surges, such as a refrigerators, freezers, microwaves and blow dryers. Connects Directly To Your Breaker Panel to Provide Power To Your Household 120v outlets… or it can also be used as a stand alone system. This Pure Sine Wave Solar Power Generator does not feed power back to the grid and does not shut off during a power outage like normal “grid tied” solar systems. Use this product for renewable solar, off-grid home and business back up power, mobile and emergency backup power applications anywhere that uses 110/120 OR 220/230/240 volts of alternating current. The inverter accepts 24 volts DC, which makes it great for vehicle upfitting as well as boat and RV applications that use a 12 volt battery system. The marine-coated or conformal-coated boards also make this inverter great for mobile applications, as it protects the product from dust or water vapor that may be present in the air. Additionally, the generator has a Power Saver mode that reduces power consumption until an actual load is detected. This inverter will also run powerful tools like most electric chainsaws, portable grinders, shop vacs, and more. Homes powering an entire breaker panel or tools with higher startup surges like air compressors may benefit from the larger inverter in the SOLGEN 60S . This 4000 watt Solar Generator produces a pure sine wave, which some appliances require for use. So it can run laser jet printers, computers, televisions, CPAP machines and other medical equipment. Also great for emergency backup power applications is the automatic transfer switch on this unit, which keeps the power supply uninterrupted in the event of an outage. With the generator hooked up to grid power, it will detect the loss of electricity and start pulling energy from the battery bank instead to keep the power supply constant. Additional Batteries and Panels Can Be Added Depending On Your Energy Requirements. Also, consider adding a Transfer Switch to use your generator full time for reducing your total energy need.